At Gardening Works we know many wonderful Master Composters but for those of you that might be wondering where to start, we thought these tips might help! First create a space in which to do your outdoor composting. This should be an open space preferably direct on the ground, otherwise on hard standing. 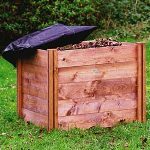 Compost can be made in a heap or a suitable container can be used such as a compost bin , which we have a huge variety of available at Gardening Works. Do You Need Lots of Compost? Why Not Order A Pallet! Ideal for growing vegetables and salads, this vegetable compost is natural with balanced feed and nutrients to give enhanced cropping and flavour and is now available at Gardening Works. These 70 litre bags of best quality Erin Excel Multi Purpose Compost and can be ordered as single bags or as a full pallet. We sell our choices of compost as a ‘value added’ service for our customers who perhaps do not have a garden centre they can get to easily on their doorstep or have mobility problems. Ideal for vegetables such as: Potatoes, Dwarf Beans, Spinach, Courgettes, Lettuces and salads, Tomatoes, Cabbage, Beetroot and Carrots and so many more. Need Lots of Compost? Simply Order A Pallet! Ideal for growing vegetables and salads, this vegetable compost is natural with balanced feed and nutrients to give enhanced cropping and flavour and is now available at The Recycle Works! At The Recycle Works we know many wonderful Master Composters but for those of you that might be wondering where to start, we thought these tips might help! First create a space in which to do your outdoor composting. This should be an open space preferably direct on the ground, otherwise on hard standing. Compost can be made in a heap or a suitable container can be used such as a compost bin , which we have a huge variety of available at The Recycle Works.